STRENGTHS: Walker is lightning-quick, jitterbug-shifty, and, after his ‘Kemba and the Kids’ miracle title run, is considered one of the greatest collegians of all-time. He’s proven he can knock down big shots, and scored at will when it was necessary for UConn down the stretch. Walker is a terrific ballhandler and an underrated passer. 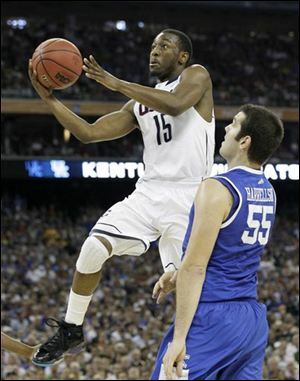 Kemba, like Jimmer, became a one-name star across the nation in a year when star power was hard to find at the big-time schools. WEAKNESSES: He’s only 6-1 (if that), and wasn’t a true pass-first point guard in college. He’s quick enough to get his own shot in the NBA, but you can count on one hand the number of six-foot superstars the league has seen in the past fifty years. Then again, you can count on one hand the number of players who led a team full of unheralded freshmen to a national title. Kemba will play in the NBA, but whether or not he can become a go-to-guy at his height is in question.